"HOW TO USE IT" ...Elastic! I was recently commissioned by a client to design a shirt based on a circa 1940's pattern that he found at an estate sale. A fan of my "prince seam", he asked that it be incorporated into the design. My client also requested his favorite pocket, my "cigar" pocket that features one straight side and one curved side. 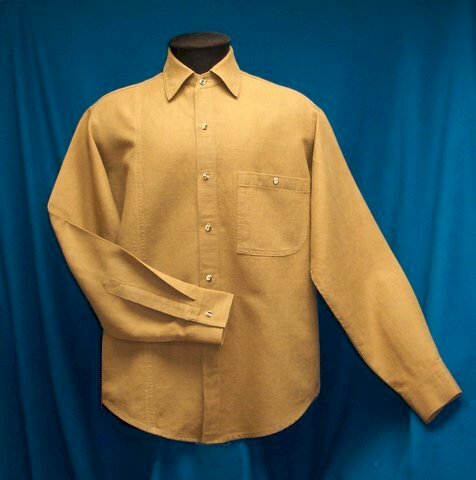 This tobacco-brown hemp shirt is the result of my slight redesign of the vintage pattern draft. Vintage details to notice include the high set and wide spread of the collar and the long, almost elbow-length sleeve plackets. Pam - your work is amazing! I'd love to see one up close to admire it stitch by stitch! I'm sure alot of the crispness is due to the interfacings you have developed. I can't wait to get them! Pam, I notice that you use hemp (or hemp blend) fabrics. I have never used them, but am interested. I love linen because I love the way it "sews". How would hemp compare with linen in that way? Oh my goodness. What a stunning shirt design, fabric and color choice, and execution. Pamela, you are by far, the classiest men's shirt designer I've seen. I am always inspired and then, of course, made to envy, by every shirt of yours I've seen. You and your sewing are so fine! An absolutely gorgious shirt!!! "Sew" great. Wonderful, professional presentation of your work! Hi Pam, I haven't been here for a while, really like the details on the hemp shirt, wow. What a wonderful shirt, Pam! I love it, as I'm sure your client did also. The details make it so special! I think your blog has a lot of great info. Love some of the styles you display. I've started a men's shoes blog/resource and will be adding to it regularly. I think that your readers may find info about man designer shoes interesting. Please provide me with your comments as well.